Oh Deer! Having some shimmery foil fun with today’s online video class. I’ll be using the new Stampin’ Up! Dashing Deer Bundle (stamp set and Detailed Deer dies). I’ll show you how to make this reverse / negative deer die cut. In addition, we’ll be doing some heat embossing. And adding the finishing touch of sparkle and shimmer with Shimmer Paints. You will want to use this technique on all of your holiday cards this season. Love these critters! Love your cards! Of course I shared it! Beautiful cards. 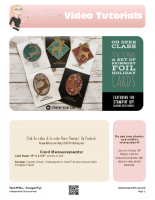 Great bundle for Christmas and beyond, so many uses for cards, etc.